Many of the scary creatures that lurk in horror movies, such as vampires, blobs, and robots, are a type of archive – a horrific archive. For example, I was watching HBO’s new series “True Blood” and the protagonist, the vampire “Bill”, told his love-interest “Sookie” that once he drank her blood he would have “a little bit of her” inside of him. He would then be able to sense her feelings, track her location; she was in some sense stored within his body. This archival monster has similarities to the “T-1000” in the film Terminator 2. Once the “T-1000” touches another living being or object it may assume its form at any time. It too keeps a record within itself. Or you might consider the Blob, from the 1988 film version of that movie; the blob absorbs people into its structure. All of this is a literal realization of the notion that when things enter the archive they die (or are un-dead), as they are disconnected from the context that gave them their particular meaning. The horrific archive is interesting because it only reveals the entirety of its contents when it dies or falls apart – usually through some intense act of violence. In the case of the vampire, the blood within it explodes out, sparkling with its collected souls. In the Terminator and the Blob films, the archive gathered by these creatures suddenly appears as an explosive outpouring of data and imagery when the monster is about to expire. The collected bodies of the T-1000 (above) are suddenly represented in quick succession. More traditional forms of archives also contain this element of horror. Consider the elderly pack rats that we read about from time to time (eg. the Collyer Brothers House, shown above). Some poor fellow who piled newspapers and magazines for years and years is suddenly found buried beneath his collection, when its entire contents come tumbling down. These people are eventually consumed – literally – by their collecting activity as their archives collapse on them. I can recall many times entering an archive and fearing that the shelves of material would come crashing down on me; or who has not thought that they might be accidentally trapped by those rolling shelves that most libraries use? Although they are a bit disturbing (or because they are disturbing) I find this horrific image of the archive inspiring when considering what archives might be and how historians might collect data. Perhaps we should build an archive that is a type of beast that collects. 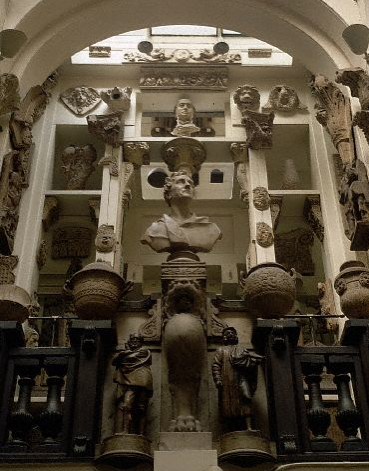 This is what John Soane did in his house. His house was a type of being that he kept feeding with more and more classical fragments. Perhaps we should reconsider the Soane-ian image by appropriating the image of the archive that moves through horror films; we should engineer an archival beast that will consume architectural knowledge. 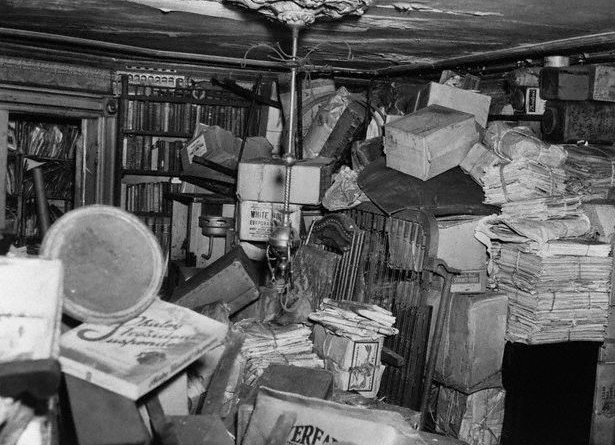 The Collyer Brothers’ house was booby-trapped, so that their stuff would fall on people who broke into their house. It’s really a very scary archive. This post makes me think of the library in the film version of Name of the Rose, which was designed to trap people who did not know its floorplan. Super information: Hope to come back! !